Purpose: To evaluate the predictability and practicality of adjustable muscle surgery in children with the aid of a special anaesthetic protocol with unique rapid recovery profile involving the use of a new analgesic narcotic agent (Remifentanil) allowing for almost immediate recovery of muscle tone and alertness permitting intraoperative judgment on alignment and its adjustment as needed. Methods: Thirty cases of alternating acquired non accommodative esotropia were enrolled in the study. Patients were subdivided into 2 Groups (Age matched, ranging from 3-11 years). The study group included 15 cases that underwent adjustable medial rectus recession with a special anaesthetic protocol involving the use of agents with unique rapid recovery profile including a new analgesic narcotic agent (Remifentanil), rapidly recovering muscle relaxant Mivacurium. And characteristically rapidly recovering anaesthetic (IV as propofol or inhalational as Sevoflurane). The control group included 15 cases that underwent non adjustable hang back medial rectus recession with a standard anaesthetic protocol. All cases were subjected to full ophthalmological and Strabismological examination. Postoperative measurements were recorded immediately post- recovery then 24 hours after surgery. Late postoperative measurements were taken 6 months after surgery. Preoperative and postoperative measurements were taken in the primary position at near. Surgical success was defined as within 10 PDs of orthotropia. Results: The success rate obtained 6 months after the surgery in the study group was 86.6% (13 out of 15 patients) while in the control group it was 80 % (12 out of 15 patients). The difference between the 2 groups was statistically insignificant (P=0.679). In the study group; orthotropia just after recovery from anesthesia was achieved in 11 out of 15 patients (73.33%).While 4 out of 15 patients (26.66%) required adjustment. The drift of measurements from the alignment obtained in the operating room just after recovery to later measurements obtained 6 months after surgery was minimal and was all within 12 PDs denoting stability of the surgical results over time. The drift of measurements from the alignment obtained 24 hours after surgery to later measurements obtained 6 months after surgery was minimal in either groups; (-1.6±6.20 PDs) in the study group and (-2.75±3.27 PDs) in the control group. The drift of measurements in either group was in the range of 8 PDs which offered stability to the surgical result achieved in either group. Conclusion: The study concludes that the effect of rapid recovery anaethesia allows faster decisions on ocular alignment and its adjustment which benefits the patient and the surgical team, saves on costs and improves the patient experience. Adjustable muscle surgery should ideally allow for precise postoperative alignment in the position judged inducing long term success. Adjustable muscle surgery was well evaluated in adults with enhanced success rates up to 90% in horizontal deviations (Figure 1) . However this technique was not well-studied or widely utilized in children due to limitations induced by age and child cooperation and the concern that adjustment process could not be completed. The efficacy and safety of this technique was evaluated by Chan et al. in a preselected group of children between 7 and 15 years of age. They retrospectively reviewed the data of 89 consecutive children undergoing adjustable suture technique to assess the ability to perform and complete adjustment in children, the frequency of need to perform adjustment and accuracy of surgical alignment. They performed adjustment 24 hours after surgery with the aid of topical tetracaine. They concluded that the application of adjustable suture technique can be considered in children with horizontal deviations over age 7 years, especially in the reoperations of esotropia. A study about the feasibility outcome of adjustable muscle surgery in younger age group was presented by Dowson et al. . A retrospective review of the data of 45 patients, under the age of 16 years, who underwent squint surgery with the adjustable suture technique between 1992 and 1999 was done. They concluded that this is an effective treatment in motivated children, as 76% of their cases obtained an excellent result. If adjustment could be done short after surgery inside the operating room, this would offer a controlled sterile enviroment as well as safety regarding proper handling of any discomfort and oculocardiac reflex. However the obstacle then to perform the adjustment will be the limitations induced by the time needed for full recovery of muscle tone and alertness of the child . Sevoflurane has gained popularity as an anaesthetic for children because it is less pungent and has lower solubility and greater hemodynamic stability than the other potent inhaled anaesthetic . Rapid recovery from anaesthetic to an alert and co­operative state is a characteristic of sevoflurane anaesthetic. Propofol is an alternative anaesthetic for short procedures and provides a smoother recovery with greater patient satisfaction than sevoflurane if used for maintenance of anaesthesia in adult patients . Remifentanil; a new analgesic narcotic agent is a typical mu-opioid receptor agonist. Its metabolism by non specific esterases gives Remifentanil the advantage of extremely rapid clearance and offset of effect which is independent of excretory organ function . To evaluate the predictability and practicality' of adjustable muscle surgery in children with the aid of a special anaesthetic protocol with unique rapid recovery profile involving the use of a new analgesic narcotic agent (Remifentanil) allowing for almost immediate recovery of muscle tone and alertness permitting intraoperative judgment on alignment and its adjustment as needed. An informed patient consent was obtained from the parents of all children included in the study after explaining the details of the surgery, the process of adjustment and its possible enhancement of the success rate. These details were explained to the parents by the author. Anaesthesia team explained to the parents the details of the rapid recovery general anaesthesia. The present study included 30 children with alternating acquired non accommodative esotropia. Patients with positive response of the deviation to glasses (Partially accomodative esotropia) were intentionally excluded not to have a confusing effect of glasses on the alignment that might lead to misinterpretation of the pre-adjustment and post adjustment measurements. The study group included 15 cases that underwent adjustable medial rectus recession titrated according to the angle of preoperative deviation with a special anaesthetic protocol. The control group included 15 cases that underwent non adjustable hang back medial rectus recession titrated according to the angle of preoperative deviation with a standard anaesthetic protocol. Full ophthalmological examination including cycloplegic refraction, fundus examination and assessment of aided and unaided visual acuity whenever possible. Measurement of the angle of deviation using the prism and alternate cover test. Further measurements in side gazes, straight up and down gazes were done whenever possible. Ductions and versions were evaluated in the 6 cardinal directions. Strabismus with any restriction of movement or gross adhesive syndrome. Associated vertical deviation>than 6 PD in the primary position. Presence of A or V pattern requiring treatment. Simultaneous vertical recti or oblique muscle surgery. Follow up duration of less than 6 months duration. Postoperative measurements were recorded immediately post- recovery then 24 hours after surgery. Late postoperative measurements were taken 6 months after surgery. Preoperative and postoperative measurements were taken in the primary position at near. Drift of measurements in the esodirection were classified with a (+) sign whereas drifts in the exodirection were classified with a (-) sign. Surgical success was defined as within 10 PDs of orthotropia. Statistical analysis of the study was done using the paired student's t-test. P value<0.05 was considered statistically significant. The anaesthetic protocol in the study group involved the use of agents with unique rapid recovery profile involving the use of a new analgesic narcotic agent (Remifentanil), rapidly recovering muscle relaxant Mivacurium, and characteristically rapidly recovering anaesthetic (IV as propofol or inhalational as Sevoflurane). The recovery of muscle tone and alertness of the child was obtained minutes after shutting off the infusion of Remifentanil allowing for judgment on alignment and its adjustment as needed while the patient was still inside the operating room. Induction by mask with Sevoflurane 5% in Oxygen or Propofol 2-3 mg/kg. The trachea was intubated after the administration of 0.2 mg/kg Mivacurium and 1 pg/kg Remifentanil. Anaesthesia was maintained with end-tidal Sevoflurane 1-2% in N20/02 mixture or a variable rate Propofol infusion 50-100pg/kg/min with the same N20/02 mixtures and Mivacurium infusion 5- 10pg/kg/min and Remifentanil infusion of 0.5pg/kg/min. The extent of muscle relaxation by the non depolarizing Mivacurium was assessed by the train of four neuromuscular monitoring (TOF guard). Approximately 20 minutes before the end of surgery, Remifentanil was terminated and the Mivacurium infusion was titrated to 75% recovery based on return of one twitch of four. Approximately 10 minutes before the end of surgery, Propofol and Mivacurium infusions were terminated and Sevoflurane was stopped. Patients were given 100 % Oxygen allowing spontaneous respirations to return. To assess emergence time the patient was asked in a normal tone of voice to open his or her eyes. This was repeated every minute until an appropriate response and a TOF ratio of 0.9 was obtained. The patients were then asked to squeeze the hand of the observer every minute after tracheal extubation until a positive response is again noted. Times to sitting up and the ability to fixate on a target were then assessed every 3 minutes. The surgical technique involved a fornix conjunctival incision. Adjustable sutures were used in the recessed medial rectus of the less dominant eye. The muscle was isolated, secured, and disinserted in the usual manner. Muscle then was allowed to hang back from original insertion the measured amount of recession and then the sliding noose adjustable technique was used. 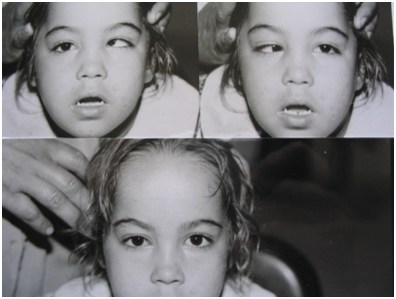 Then all suture material (muscle suture arms and the sliding noose) were then gently held together and adhered to the child's forehead above the medial aspect of the eye brow under a piece of previously sterilized adhesive plaster in preparation for post recovery measurements and later adjustment (Figure 2 middle). Operative field, all instruments as well as the assisting nurse were all kept in the same condition of sterilization while the child was allowed to recover and post recovery measurements were taken in order to lessen the operative time when the process of adjustment and/or final tie - off of the sutures was carried out. Adjustment was done in the operating room minutes after shutting off the anaesthesia & extubation. The child was asked to sit and fix on an accommodative target. The quality of pursuit and saccadic eye movement were used to judge alertness and suitability of the cover testing. The target angle was exact orthotropia just after recovery which was then verified using the prism and alternate cover test or corneal light reflexes in younger children. Postoperative near measurements were taken in the primary position. Brief anaesthesia with IV propofol (Img/kg) was used for permanent adjustment and or tie-off of the suture arms and the sliding noose. Thirty patients were included in this study. The study group included 15 cases; they were 7 females and 8 males. The ages in this group ranged from 4- 11 years with a mean of 6.96±2.15. The control group included 15 cases; they were 8 females and 7 males. The ages in this group ranged from 3-11 years with a mean of 6.13 ±2.86. The difference in the ages between the 2 groups was not statistically significant (P = 0.375). The degree of preoperative deviation for near fixation in the study group ranged from 30-65 PDs with a mean of 49±9.29 PDs while the degree of preoperative deviation for near fixation in the control group ranged from 30-55 PDs with a mean of 43.3±9.57 PDs and the difference between the 2 groups was statistically insignificant (P= 0.11). The amount of medial rectus recession in the study group ranged from 5.5-13 mm with a mean of 9.9±2.26 mm while the amount of medial rectus recession in the control group ranged from 5.5-12 mm with a mean of 8.86±2.32 mm and the (Terence between the 2 groups was statistically insignificant (P= 0.22). In the study group, the target angle just after recovery from anaesthesia was exact orthotropia. These immediate post recovery measurements using the alternate prism and cover test or corneal reflex test were used as a critical decisive factor for the need of further adjustment. In the study group; Orthotropia just after recovery from anaesthesia was achieved in 11 out of 15 patients (73.33%), while 4 out of 15 patients (26.66%) required adjustment. The immediate post recovery measurements for near fixation in the study group ranged from 10 PDs exotropia to 10 PDs of esotropia with a mean of 0±5.34 PDs. Cases with measurements other than exact orthotropia are the cases which required adjustment (Cases 4,6,7,8). Cases with post recovery esotropia (Cases 4,8) required further loosening of the muscle while cases with post recovery exotropia (Cases 6,7) required slight advancement of the muscle in an appropriate amount. The final total amount of the medial rectus recession in the study group ranged from 5.5 to 14.5 mm with a mean of 9.75±3.01 mm while The final total amount of the medial rectus recession in the control group ranged from 5.5 to 12 mm with a mean of 8.86±2.32 mm and the difference between the 2 groups was statistically insignificant (P=0.23). The postoperative measurements for near fixation obtained 24 hours after surgery in the study group ranged from 5 PDs of exotropia to 18 PDs of esotropia with a mean of 4.56±6.01 PDs The postoperative measurements for near fixation obtained 24 hours after surgery in the control group ranged from 0-25 PDs of esotropia with a mean of ±7.06 PDs and the difference between the 2 groups was statistically insignificant (P=0.14). The late postoperative measurements for near fixation obtained 6 months after surgery in the study group ranged from 15 PDs of exotropia to 18 PDs of esotropia with a mean of 3.13±7.17 PDs. The late postoperative measurements for near fixation obtained 6 months after surgery in the control group ranged from 0-16 PDs of esotropia with a mean of 5.46±5.37 PDs and the difference between the 2 groups was statistically insignificant (P=0.32). As regards the drift pattern in the study group: the drift of measurements between the immediate post recovery measurements used as the critical factor for adjustment and the late postoperative measurements at 6 months after the surgery used as the critical factor for judgment on the stability of the surgical effect ranged from -18 to 10 PDs with a mean of 3.13±8.10 PDs (Tendency towards an esotropic shift). As regards the drift of measurements between the immediate post recovery measurements used as the critical factor for adjustment and the postoperative measurements obtained 24 hours after the surgery in the study group ranged from -5 to 18 PDs with a mean of 4.8±7.21 PDs (Tendency towards an esotropic shift). As regards the drift of measurements between the post operative measurements obtained 24 hours after the surgery and those obtained 6 months after the surgery in the study group ranged from -15 to 10 PDs with a mean of - 1.6±6.20 PDs. In the study group; measurements of post recovery alignment were all within 12 prism diopters of the measurements taken 24 hours after surgery (4.8±7.21 PDs). Measurements of post recovery alignment were also all within 12 prism diopters of the measurements taken 6 months after surgery (3.13±8.10 PDs). As regards the drift pattern in the control group; the drift of measurements between the measurements obtained 24 hours after surgery' and the late postoperative measurements at 6 months after the surgery used as the critical factor for judgment on the stability of the surgical effect ranged from 0 to -9 PDs with a mean of-2.75±3.27 PDs. The difference between the 2 groups as regards the drift pattern between the measurements obtained 24 hours after surgery and the late postoperative measurements at 6 months after the surgery was statistically insignificant (P=0.46). The criterion of surgical success was defined as orthotropia or residual deviation within 10 PDs of orthotropia obtained after surgery. The success rate obtained 24 hours after surgery in the study group was 93.3% (14 out of 15 patients) while in the control group it was 80% (12 out of 15 patients). The difference between the 2 groups was statistically insignificant (P=0.678). The success rate obtained 6 months after the surgery' in the study group was 86.6% (13 out of 15 patients) while in the control group it was 80 % (12 out of 15 patients). The difference between the groups was statistically insignificant (P=0.679). As regards the anaesthetic results in the study group; all patients could attain an alert state and fixate on an accommodative target short after stopping the infusion of Remifentanil and extubation permitting the measurement of post recovery angle of deviation. No significant post anaesthetic nausea and vomiting precluding post recovery measurements and adjustment were encountered. Reflex bradycardia during the process of adjustment was easily managed inside the operating room with close monitoring by the anesthetic team. The mean duration from the time of extubation to the time when the patient could fixate on an accommodative target was 15±2.3 minutes. 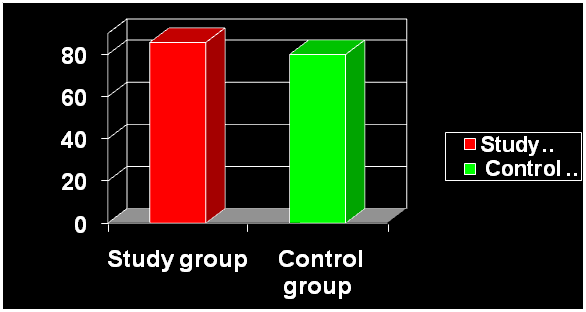 Figure 1 shows the success rates in the study and the control groups. Figures 2-4 show some of the results in the study group. (Table 1 and Table 2) summarize the surgical results in the study and control groups respectively. Figure 1: A diagram showing the success rates in the study and the control groups. Figure 2: Composite figure (Case number 6; study group). "Middle: Few minutes after recovery; before adjustment; ET 10PDs. *Lower: 6 months after surgery; Orthotropia. Figure 3: Composite figure (Case number 1; Study group). Figure 4: Composite Figure (Case number 4; Study group). *Upper: Alternating ET 60 PDs. *Lower: 6 months after surgery: Orthotropia. Preferences for the timing of the postoperative suture adjustment vary from the day of surgery to the next morning. The ability to perform suture adjustment in the operating room immediately after surgery is an attractive alternative with respect to patient monitoring, sterility and comfort. Most reports of the adjustable suture technique were in adults while little information’s exist concerning adjustable pediatric strabismus surgery. The goal of this study was to evaluate the predictability and practicality of adjustable muscle surgery in children with the aid of a special anaesthetic protocol with unique rapid recovery profile permitting intraoperative judgment on alignment and its adjustment inside the operating room as needed. Fifteen cases with acquired non accommodative esotropia were enrolled as a study group undergoing adjustable medial rectus recession with a special anaesthetic protocol. The control group included fifteen cases with acquired non accommodative esotropia undergoing nonadjustable medial rectus recession with a standard anaesthetic protocol. The overall success rate (within 10 PDs of orthotropia) 6 months after surgery was achieved in 86.6 % (13/15) of patients in the study group. This is very near to  who reported that 84% of children with primary esotropia achieved successful alignment. Our success rate was also near to  who reported a success rate of 76% in their study. Twenty six percent (2/15) of children in the study group required adjustment to achieve orthotropia after recovery. This is nearly identical to , who reported that of the 89 patients included in their study, 24 (27%) required further adjustment. Ninety three percent (14/15) of patients in the study group experienced either no change of measurements or a tendency for a later slight esotropic shift from the alignment obtained in the operating room when compared to later measurements obtained 24 hours after surgery (4.8±7.21 PDs). Thirteen out of 15 patients (86.6 %) in the study group experienced either no change of measurements or a tendency for a later slight esotropic shift from the alignment obtained in the operating room when compared to later measurements obtained 6 months after surgery (3.13±8.10 PDs). However the drift of measurements was minimal, and was all within 12 PDs denoting stability of the surgical results overtime. This matches with  who reported that in their study 21 out of 29 patients showed an esotropic shift from the alignment obtained in the operating room when compared to the alignment obtained 18-24 hours after surgery however the drift of the measurements was all within 12 PDs. They postulated that a residual anesthesia effect may be responsible for the increased divergence immediately postoperatively. This may explain a divergent to convergent trend. The drift of measurements from the alignment obtained 24 hours after surgery to later measurements obtained 6 months after surgery was minimal in either groups; (-1.6±6.20 PDs) in the study group and (-2.75±3.27 PDs) in the control group. The drift of measurements in either group was in the range of 8 PDs which offered stability to the surgical result achieved in either group. Our results are near to  who reported that the change in deviation after 6 weeks of follow up from the alignment achieved immediately after adjustment of sutures was 8 PDs or less horizontally in all patients. Our results also agree with  who reported in their study that the drift of measurements from the alignment obtained after adjustment 24 hours after surgery to later measurements obtained at the follow up visit had a mean of -1.6 PDs in their primary esotropia group. The study concludes that the effect of rapid recovery anaethesia allows faster decisions on ocular alignment and its adjustment which benefits the patient and the surgical team, saves on costs and improves the patient experience. 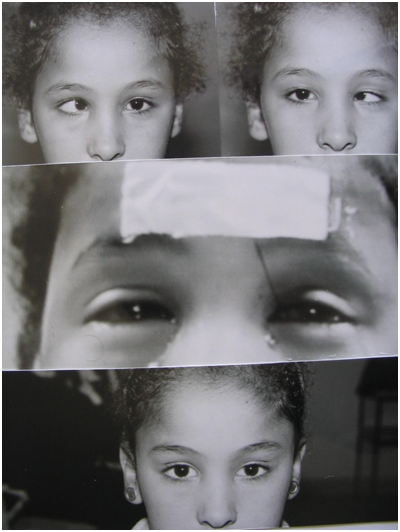 Wisnicki HJ, Repka MX, Guyton DL (1988) Reoperation rate in adjustable strabismus surgery. J Pediatr Ophthalmol Strabismus 25(3): 112-114. 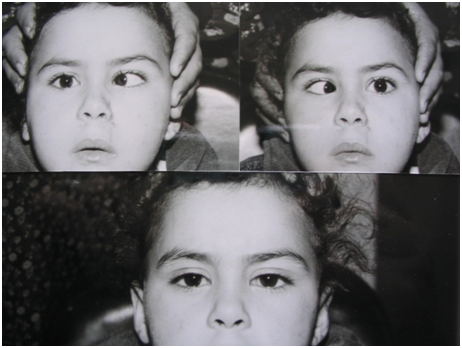 Chan TK, Rosenbaum AL, Hall L (1999) The results of adjustable suture technique in pediatric strabismus surgery. Eye 13(Pt 4): 567-570. Dawson E, Bentley C, Lee J (2001) Adjustable squint surgery in children. Strabismus 9(4): 214-221. Lerman J (1995) Sevoflurane in pediatric anesthesia. Anesth Analg 81(6 Suppl): S4-S10. Tang J, Chen L, White PF, Watcha MF, Wender RH, et al. (1999) Recovery profile, costs and patient satisfaction with propofol and sevoflurane for fast-track office- based anesthesia. Anesthesiology 91(1): 253-261. Rosow CE (1999) An overview of remifentanil. Anesth Analg 89(4 Suppl): S1-S3. Savarese JJ, Lien CA, Belmont MR, Rubin L (1995) The clinical and basic pharmacology of mivacurium: a short-acting noodepolarizing benzylisoquinolinium diester neuromuscular blocking drug. Acta Anaesthesiol Scand 106: 18-22. Ward JB, Niffenegger AS, Lavin CW, Acquadro MA, Ahern DK, et al. (1995) The use of propofol and mivacurium anesthetic technique for the immediate postoperative adjustment of sutures in strabismus surgery. Ophthalmology 102(1): 122-128. Cogen MS, Guthrie ME, Vimk HR (2002) The immediate adjustment of sutures in strabismus surgery with comaintenance of anesthesia using propofol and midazolam. J AAPOS 6(4): 241-245.